Why do a driving contract? If your child dies during the teenage years, the most likely cause will be an auto accident. Your teenage driver is in danger of killing or injuring himself or herself or other innocent people. If you don’t do a contract, you will likely be vague in your rules and directions about driving. 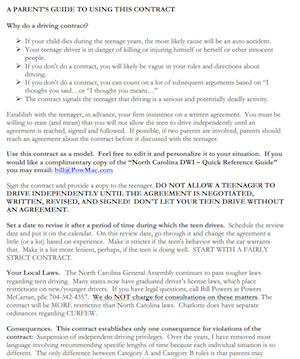 The contract signals the teenager that driving is a serious and potentially deadly activity. Establish with the teenager, in advance, your firm insistence on a written agreement. You must be willing to state (and mean) that you will not allow the teen to drive independently until an agreement is reached, signed and followed. If possible, if two parents are involved, parents should reach an agreement about the contract before it discussed with the teenager. Sign the contract and provide a copy to the teenager. DO NOT ALLOW A TEENAGER TO DRIVE INDEPENDENTLY UNTIL THE AGREEMENT IS NEGOTIATED, WRITTEN, REVISED, AND SIGNED! DON’T LET YOUR TEEN DRIVE WITHOUT AN AGREEMENT. Set a date to revise it after a period of time during which the teen drives. Schedule the review date and put it on the calendar. On this review date, go through it and change the agreement a little (or a lot) based on experience. Make it stricter if the teen’s behavior with the car warrants that. Make it a bit more lenient, perhaps, if the teen is doing well. START WITH A FAIRLY STRICT CONTRACT. Your Local Laws. The North Carolina General Assembly continues to pass tougher laws regarding teen driving. Many states now have graduated driver’s license laws, which place restrictions on new/younger drivers. 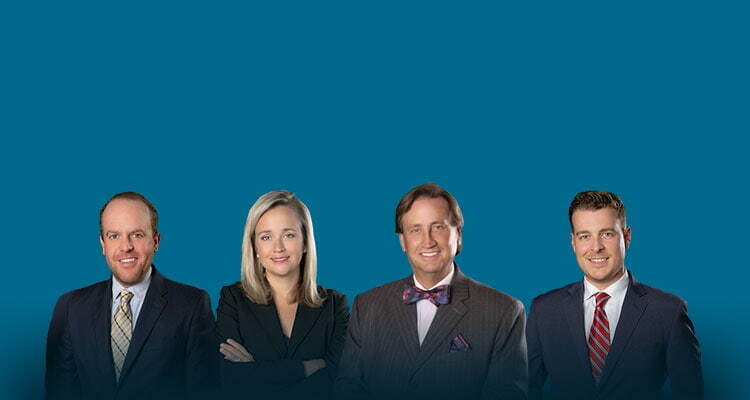 If you have legal questions, call Bill Powers at Powers Law Firm, pllc 704-342-4357. We do NOT charge for consultations on these matters. The contract will be MORE restrictive than North Carolina laws. Charlotte does have separate ordinances regarding CURFEW. Consequences. This contract establishes only one consequence for violations of the contract: Suspension of independent driving privileges. Over the years, I have removed most language involving recommending specific lengths of time because each individual situation is so different. The only difference between Category A and Category B rules is that parents may choose to give a warning for the first violation of Category B rules. Category A rules call for immediate suspension independent driving privileges. Alcohol and drug use. While the contract has the young driver acknowledging that underage drinking is illegal, it also includes a statement that if the young person drinks, he or she will not drive for 24 hours. Some parents read this as permission to drink. It is, rather, an acknowledgment that people break laws and do reckless things. Limits on passengers. This is an essential rule. There is a very direct relationship between the number of passengers in the car with a teenage driver, and the likelihood of an accident. It also, of course, increases the number of potential deaths or injuries. We highly recommend not exceeding a limit of 1 passenger during the first year of driving. Require your child to read the entire contract to you, aloud. Require your child to sit while you read it to them. Before signing, sit down together, read each item together, and discuss. ____ I will obey laws regulating driving. I will observe and obey posted speed limits. I will obey rules established by my parents. I recognize these are for my protection and the protection of others. ____ I understand that the car I drive is property of my parents. Even a car that is a “gift” to me is still, legally, the property of my parents. I drive the car only with permission. ____ I understand that my parents and I must be able to reach this written agreement in order for me to be permitted to drive. I understand that the terms of this agreement may be changed, to be more or less strict, based on how I handle the freedom and responsibility of driving. ____ In some cases, this contract is more restrictive than the law. I understand that my parents have the right to place more restrictions on my driving than is called for by the law. This contract establishes penalties for violating driving rules. The penalties involve suspending my independent driving privileges for a length of time to be determined by my parent(s). During this time, I will not be allowed to drive without a parent, guardian, or other responsible adult (determined by the parent), in the car. These rules, if violated, will lead to suspension of independent driving privileges. I will not be let off with a warning. I understand that I may lose my independent driving privileges for as long as my parent decides if any one of these is violated even once. If my parents deny me permission to drive, for whatever reason, I will obey this and give them my keys immediately with no argument or debate. If I drive in defiance of my parents’ order not to drive, this contract is cancelled and no independent driving (driving without a parent or guardian in the car) will be permitted until further notice. I will not leave the scene of an accident, no matter how minor, without the permission of police officers and/or my parents. No alcohol use/abuse. It is illegal for me to drink alcohol. However, if I do break the law by drinking anything alcoholic I will not drive for 24 hours. No drug use/abuse. I will not drive for 48 hours after my last use of any “substance.” “Substance” means any drug or chemical (including but not limited to marijuana, pills, inhalants, and other drugs) which would be expected by my parents to alter my ability to drive. There is no acceptable amount of any substance of this kind. This rule may include medications prescribed to me or over-the-counter medications. In the cases of legal medications, I will inform my parents of any such medications I have taken so that they can judge whether taking these medications will interfere with my driving ability. No alcohol or drugs in car. I will not allow alcohol or illegal drugs in the car. This includes over-the-counter medications (cough medicines, etc.) when I have reason to believe someone has them in their possession for purposes of abuse. My parents will hold me responsible for any alcohol or drugs in the car, even if they don’t belong to me or it is the fault of someone riding in my car. No riding with others who have used alcohol or drugs. I will not ride as a passenger with any driver who has used alcohol or any substance as defined above. Alternatives to riding with others who have used alcohol or drugs. If I find myself in a situation as described above, I will contact my parents or another designated adult to arrange for transportation. I understand that my parents will appreciate that behavior and will make every effort to avoid asking me a lot of questions about it. TEXTING, CELL PHONES, MP3 Players, GPS System. I will not use cell phones, MP3 players, or any other electronic device while driving. I will pull over for other operations of cell phones and electronic equipment. Limit on passengers. I understand that the presence of other teenagers in the car with me will increase the chances of an accident. I will, therefore, always have limits on passengers while I am a teenage driver. Immediately after I receive my license, I will not be allowed to have any teenage passengers except by permission of my parents for a specific situation, such as carpooling to school. As I gain experience, I will be allowed one passenger. Over time, this will be subject to review. No thrill-seeking/stunts. I will not engage in any thrill-seeking behavior while driving. I will not drive for recreation. Driving too fast, racing of all kinds, and any kind of “stunt” involving a car is NOT ALLOWED. Driving is for transportation ONLY. No driving with passengers who are not wearing seatbelts. I will wear my seatbelt at all times and require all passengers to wear them. I will check to make sure all belts are fastened before I drive. This includes ANY driving of any distance with more passengers than the vehicle is designed to carry. No firearms or other weapons. I will not drive with any guns or other deadly weapons in the vehicle. First violation may lead to warning or suspension of driving privileges. If a violation is repeated after a warning, independent driving privileges will be suspended for a length of time to be determined by my parents. NOTE: These are strict rules, some of which may be revised when we review this contract in a few weeks. Permission to Drive. When I first begin driving by myself, I must ask permission to drive each time I drive. Exceptions to this rule will be given for regularly scheduled transportation to school, work, regular meetings, etc. I will ask permission to drive to specific locations and will discuss the route planned. I will be certain that my parents know where I am. I will not make unscheduled stops or side trips. Staying in touch. When I am away from my parents, I will inform them of exactly where I am. I will call my parents when I have arrived at the intended location, before I change locations, and before I start my trip home. If my first call does not reach my parents, I will try all available numbers and leave messages at each. No one else drives vehicle. I will not permit any other person to drive the car without my parents’ specific permission for each specific case. Car audio system. For the first month I drive, I will not have the car stereo on. After the first month, after clearing this with my parents, I will be allowed to have the stereo on but will make no adjustments to it other than changing the volume while driving. Under no circumstances will I change a CD while driving. I will change these only when stopped or pulled over. Weather/road conditions. I will respect weather and road conditions, slowing down as needed for safety. I will contact my parents to discuss weather or poor road conditions when I am out driving. Emotional upset. Knowing that judgment and driving skills are altered by emotions, I will not drive when I am upset or angry. If upset, I will contact my parents for transportation and I reserve the right to maintain my privacy regarding personal matters. My parents agree not to ask a lot of unnecessary questions. Friends ride only with their parents’ permission. When transporting my friends, I will be reasonably sure that they have their parents’ permission to ride with me. Thank You for Not Smoking. I will not allow smoking in the car. I will not smoke in the car. No eating & driving. I will not eat while driving. No rushing. Accidents are more likely to happen when I rush. I am more likely to rush when I leave late. Therefore, my parents reserve the right to not allow me to drive unless I leave by a time they specify. For example, if my parents tell me that I must allow 20 minutes to get to something that starts at 7:00, I may not leave later than that. In such cases, my parents will attempt to provide alternative transportation, to whatever extent possible. Attention to driving. I will not do things while driving that distracts me from the road. No applying makeup, getting things in and out of a purse or back-pack, etc. The most common age at which people are killed as passengers in cars is when they are teenagers. Therefore, my parents will set limits on who I may ride with and under what conditions I may ride with them. I must ask permission every time I ride with any driver other than my parents. I promise to truthfully inform my parents who the driver is, how many passengers will be in the vehicle, and truthfully answer any other questions they ask me. I may not ride with any new driver who has had their license for less than six months. I will not ride with drivers or passengers who have recently used alcohol or drugs or who it would be reasonable to think may have recently used alcohol or drugs. I will not ride when I know or suspect alcohol or drugs are in the vehicle. I will not ride in a car unless I can use a seatbelt and I will, in all cases, use the seat belt. I will not ride in a car when guns or weapons are in the car. Rather than ride in an unsafe situation, I will contact my parents or another designated adult to arrange for transportation. If I feel unsafe while riding with someone, I will do what I can to get out of the car and contact my parents. Tickets and moving violations will result in suspension of my driving privileges for a period to be determined by my parents. My parents have no obligation to pay my fines for driving-related tickets. Changes in this agreement. I understand that this contract will be made more strict at any time my parents believe that is the best thing to do. I understand that if I consistently abide by these rules that my parents will work with me to make the contract less strict as I gain experience. However, I understand that–bottom line–it is my parents’ choice and responsibility to change or not change the contract. We will review this agreement and perhaps make changes to it on ______________(date) or earlier if my parents or I wish to do so. Summary: I agree to abide by the rules in this contract and I accept the consequences and penalties if I do not. I recognize my parents’ authority in deciding if I may drive. That authority is final until I am an adult living independent of my parents. I further agree that “forgetting” something in this contract is not a valid excuse. THIS CONTRACT WILL BE REVIEWED AND POSSIBLY REVISED ON ________________________(date).